Whether you're helping economically disadvantaged people find nutritious, fresh, and affordable produce, managing food banks, or simply trying to chart the most popular edibles in a given area, Resource Map makes it easy. And since Resource Map can be updated using almost any cellular phone, your resource data is always just as fresh as the food. Getting started with Resource Map is simple. Just enter resource allocation data manually or upload an existing spreadsheet containing the data. Once your data is online, it's easy to keep tabs on resources visually, on a real-time map, using any computer or smartphone. Even better, field teams can receive alerts, update resource deployment, and query resource status using any phone that can send and receive text messages, in addition to using a computer or smartphone. If you can get a cell phone signal, you can view and manage resources with Resource Map. With the support of the Clinton Health Access Initiative (CHAI), CNM uses Resource Map to support their malaria drug program with our tool to capture malaria drug updates from at risk health centers on a two week cycle. The goal of monitoring resources so closely is to improve the stock management of malaria treatment drugs. This tool helps the health centers to avoid the possibility of over or under stocking important drug supplies. With the support from the Global Fund, the Center for Malaria Parasitology and Entomology of Laos PDR (CMPE) uses Resource Map to report both the stock levels of life saving malaria drugs and the number of Malaria cases located at the village health centers up to the national level. This allows the Ministry of Health to have a real time visual picture of what resources are available and what is needed to treat patients. 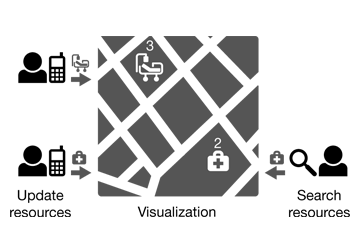 The Rwanda Ministry of Health uses Resource Map as its Facility Registry service. The Facility Registry provides the master list of hospitals, clinics and health services and is a building block of Rwanda's national Health Information System, which integrates Resource Map data into clinical and public health workflows and tools across the country.